Henry A “Hank” Bauer was born in East St Louis, Illinois on July 31, 1922. The youngest of nine children, Bauer's father was an Austrian immigrant who worked as a bartender having earlier lost his leg in an aluminum mill. After graduating from Central Catholic High School, Bauer went to work repairing furnaces in a beer-bottling plant when his older brother Herman – who was playing in the White Sox farm system - was able to get him a tryout that resulted in a contract with Oshkosh Giants of the Wisconsin State League. Alternating between infield and outfield, he batted .262. In January 1942, Bauer enlisted in the Marine Corps. He took basic training at Mare Island, California, where he also played for the camp baseball team. But the easy life came to an abrupt halt. "One morning," Bauer told TIME magazine in 1964, "this sergeant came up to me and said, 'Why don't you volunteer for the Raider battalion?' I said okay. But the first thing they told me was, 'You've got to swim a mile with a full pack on your back.' I said, 'Hell, I can't even swim,' and they turned me down. I told the sergeant what happened. He said, 'You gutless SOB, go back down there.' So I told them I knew how to swim. They took me." Bauer came down with malaria almost as soon as he hit the South Pacific. "My weight dropped from 190 pounds to 160 pounds," he said. "I was eating atabrine tablets like candy." Temporarily recovered (over the next four years, Bauer had 24 malarial attacks), he fought on New Georgia, was hit in the back by shrapnel on Guam. Next came Emirau off New Guinea, then Okinawa. Sixty-four men were in Platoon Sergeant Bauer's landing group on Okinawa; six got out alive. Hank himself was wounded again on June 4, 1945. "I saw this reflection of sunshine on something coming down. It was an artillery shell, and it hit right behind me." A piece of shrapnel tore a jagged hole in Bauer's left thigh. Also wounded that day was Richard C Goss, who was serving with Bauer. "There goes my baseball career," Bauer told Goss as they were evacuated together. Bauer's part in the war was over —after 32 months of combat, eleven campaign ribbons, two Bronze Stars and two Purple Hearts. His brother, Herman, was not so fortunate. He was killed in action in France with the 3rd Armored Division on July 12, 1944. Bauer felt there was no future for him in baseball so he joined the pipe fitters' union in East St. Louis, and got a job as a wrecker, dismantling an old factory. But a roving baseball scout named Danny Menendez found him and offered him a tryout with the Quincy Gems, a Yankees’ farm club. 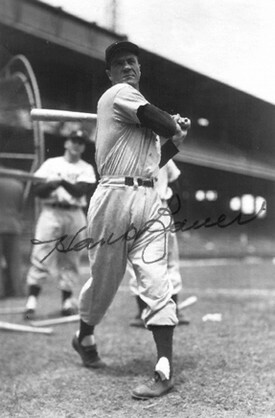 Bauer hit .323 at Quincy and promptly moved up to the Kansas City Blues, where he hit .313 in 1947 and .305 in 1948. 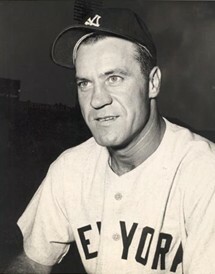 Bauer played 19 games with the Yankees in 1948, he played 100-plus games in Yankees’ pinstripes for the next 11 seasons, plus nine World Series appearances. During the 1960s, Bauer managed the Kansas City Athletics and Baltimore Orioles. In 1966 he led the Orioles to the World Series where they defeated the Dodgers in four games. Bauer then ran a liquor store for many years. Hank Bauer died of cancer in Shawnee Mission, Kansas on February 9, 2007. Some of the information in this biography was obtained from TIME magazine September 11, 1964. Further information was kindly supplied by Rebecca Collins, daughter of the late Richard C Goss, who did an interview for the Admiral Nimitz Museum and talked about Bauer. Read the biography of his brother, Herman Bauer. Created February 11, 2007. Updated September 1, 2008.